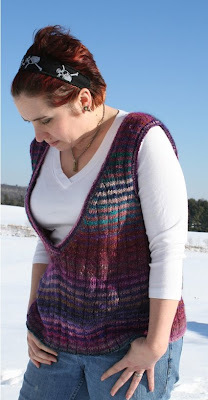 I finished the back of my vest, even though I gave it a second start after knitting 4 or 5 inches. It did look a little tight on me, hence the ripping and fresh start. 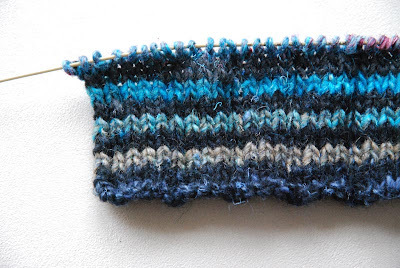 Knitting is fun, especially watching how the colors develop and which color combinations show up. 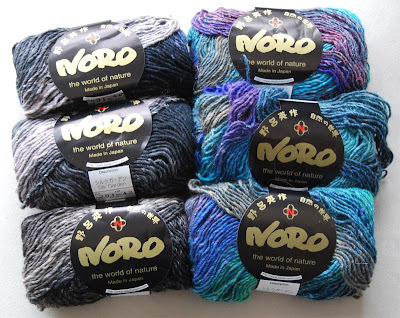 I had a couple of knots though, very typical for Noro yarns. The Silk Garden does feel much nicer than the yarn I used for my Lizard Ridge blanket, though. It's more expensive as well. I think I'm all socked out, so I decided to do something else for a change. I've had my eyes on that vest for a while and finally decided it's time to give it a shot. 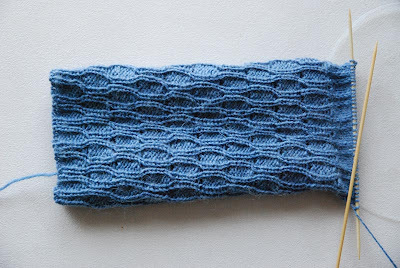 My gauge was off though (19 stitches to the 10cm instead of the 22 stitches in the pattern) but I didn't want to change the needle size to something smaller, as I really did like the tension as it is - anything tighter and it would have been too stiff. I did some math and hope it'll work out. 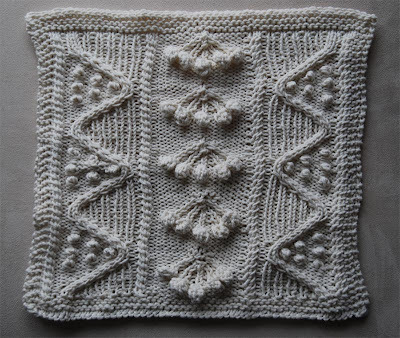 While I was waiting for my chance to get the yarn, I fell back to the Aran Afghan I started ... ehr, a while ago. The first square I tried I didn't like so I ripped it up and did this one instead. It's the one by Ann McCauley and there are a few tiny mistakes in it, but I decided I don't care and won't rip it up (again!!!). Last week a fanfic bunny attacked me viciously. I have those attacks once in awhile and usually I can resist. I know I'm a decent, but not a brilliant fanfiction writer (especially, because I write in English, which is, after all, not the language I've grew up with). Usually find the effort to hammer out a story, especially if it's a long one, too tedious to bother, and I'm not exactly a fast writer. I have a couple of rules when I write fiction and one is that I won't start posting a story, unless I've finished it and somebody has betaed it. I do love reviews - who doesn't - but I will not go and hold my readers hostage, by telling them I will only continue writing if I get at least x amount of reviews. Well, I'm not going to break my rule this time, but that means I'll be spending a lot of my time the next few weeks behind the keyboard, writing. So not much knitting, not much stitching. I've already written over 18.000 words and I think there will be about the same amount again before I'm done, which means this will be the longest story I've ever tackled. The fandom is Twilight, which is also not the fandom that I thought would get me back to the keyboard. But it happened, and I'm helpless, so I write on. How does that quote go? "A true writer is somebody who write because he has to, not because he wants to." At least I've now got 28 of the 64 squares of the Sampler Game Board finished. That's almost half. 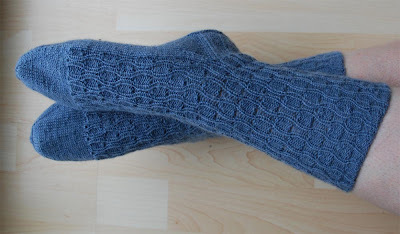 And I also finished another pair of socks. 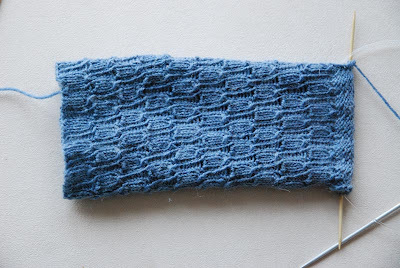 The pattern is the 'Undulating Rib Sock' pattern from the Favorite Socks book, but I inversed it, as I like the inside better than the outside. As the shaft and the foot are knitted inversed from each other (that is, I knitted the shaft following the pattern, then turned it inside out, and then knitted the foot bit with all the purls as knits and all the knits as purls) the foot stitches look a little bit different then the rest. Not too noticeable I hope. Jutta, if you like then, give me a shout and I put them aside for you. I think they meet your request that they have to match jeans. They're a bit scratchy though. Just to let you know, there's nothing to show this week, really. 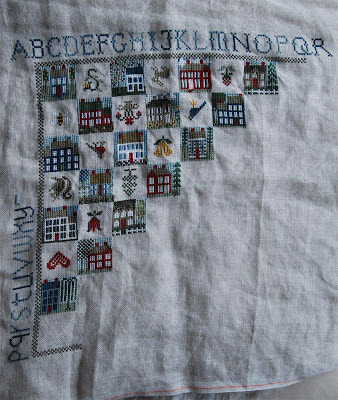 I've made some progress on the Sampler Game Board, but that was it basically. Yesterday my family and I went to see the musical Wicked in Stuttgart. It was the birthday present from my sister and I for my parents. Even though it was 'only' an afternoon show the theater was packed. I enjoyed it a lot (though I still prefer the English version ... but that's me *shrug*). 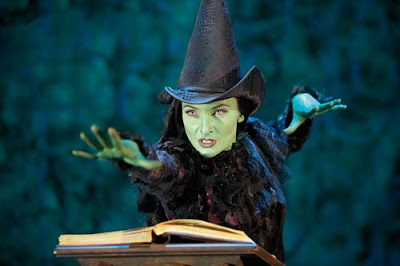 The cast was fantastic, especially the actress who played Elphaba. 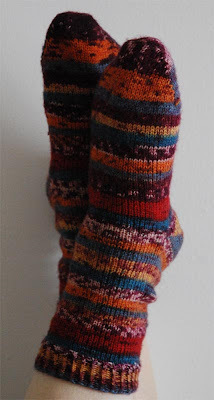 Other than that, I've finished one pair of sock (oh, what a surprise) and started the next already. Finished pair: Yarn is from the sale at Aldi, the pattern simply plain socks with short row heel and toe. 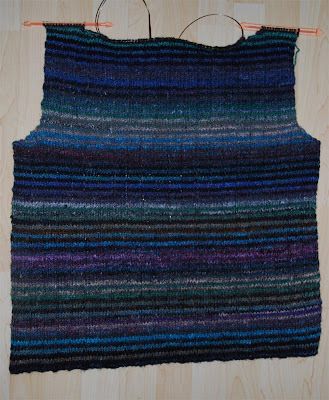 And, well, I like the wrong side better, so it looks like I'm going to knit this one inside out for a change. I have to see how it works out.